For any organization that handles sensitive data and confidential client information, Integrated Computer Services offers its best-in-class cloud-based email encryption service. ICS Secure Cloud: Email Encryption with DLP (Data Loss Prevention) is an intelligent, fully automated service that reliably secures sensitive outbound email messages. Organizations that operate within highly regulated industries like banking, insurance, and healthcare often require robust encryption programs that auto-encrypt nearly every outgoing message. However, while other businesses in other industries may not deal with confidential data or network security risks on a regular basis, practically every business will, at some point, share some sort of sensitive information via email. Whether this happens commonly within an organization, or just on the rare occasion when an unwitting employee shares confidential info without realizing the consequences of such an action, it's not a matter of if, but when a vulnerability will occur. As an organization, you're charged with ensuring you're using technology responsibly, while also not unnecessarily burdening your employees, clients, and vendors by forcing them to contend with time-consuming encryption for every single email that's sent out from your servers. Though not a substitute for training all employees in email-security best practices, our email encryption service is a fully automated complement, completely customizable and not vulnerable to human error or oversight. It's virtually foolproof and should be a key component in every company's DLP toolkit. 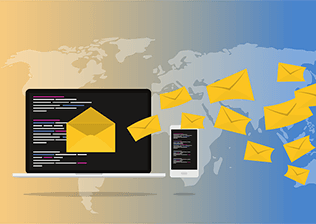 Programmable Filters: These filters trigger encryption when an outbound email is sent that includes simple words or phrases (which you control) in the subject, header, or body. Predefined Filters: These filters identify and encrypt outgoing messages that match predetermined data-leakage patterns to meet HIPAA IT compliance and other email security regulations. Emails containing credit card numbers, social security numbers, dates of birth, driver's license numbers, addresses, phone numbers and more: all (or any combination) of these are automatically identified and encrypted. To prevent sensitive medical info from being shared, the filter can automatically identify emails sent with at least one private piece of data (such an address) as well as at least one medical term. Outgoing SPAM blocking: In addition to being an email encryption service, this program also blocks outgoing messages that might be construed as SPAM. This is critical to protect your company's brand and public image as well as to prevent your organization from being blacklisted on email servers. Incoming SPAM protection: To round out its set of features, ICS Secure Cloud: Email Encryption with DLP also prevents SPAM from ending up in your organization's email accounts. Unlike other email encryption programs, our ICS Secure Cloud DLP encryption feature is foolproof. There's no need to activate other software or tools when sending outgoing mail - it's done automatically based on the exact filters that meet the needs and requirements of your organization and industry. At the same time, there's no need to frustrate customers and other contacts by forcing them to sign into an email encryption service to read every benign message that your employees send out. Call us to learn more about this and other services we offer to help you fully secure your company's technology! We'll even provide you with a complimentary on-site assessment.